You can expect these shares to get a good boost from the weaker rand since their offshore denominated revenues increase in value as the rand goes weaker and weaker. If you would like to take advantage of this opportunity, contact our dealing desk today at 021�700 4815 and we will have you rand-hedged in no time! 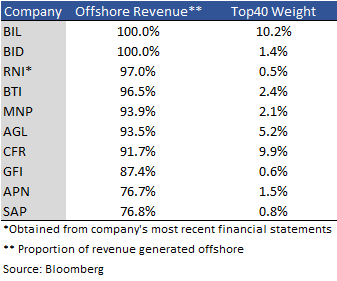 Note that there are many factors that affect the value of a company and the split of its revenue between local and offshore is merely one of them. Joani van Wyk joined the asset management team in January 2017, responsible for quantitative research of equities across all industries. Joani completed her degree in Mathematical Science in 2015, as well as an Honours degree in Financial Risk Management in 2016, both at the University of Stellenbosch. She is currently a CFA candidate.